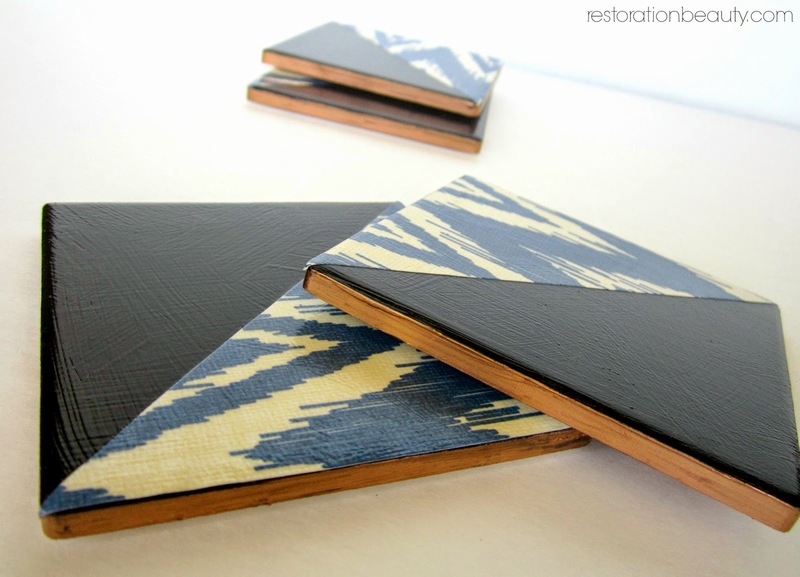 I cannot put the Mod Podge down since using it to spruce up my Black & Gold Table Makeover! Seriously. I have a long list of Mod Podge projects to try and release my obsession for this multi-purpose glue on. 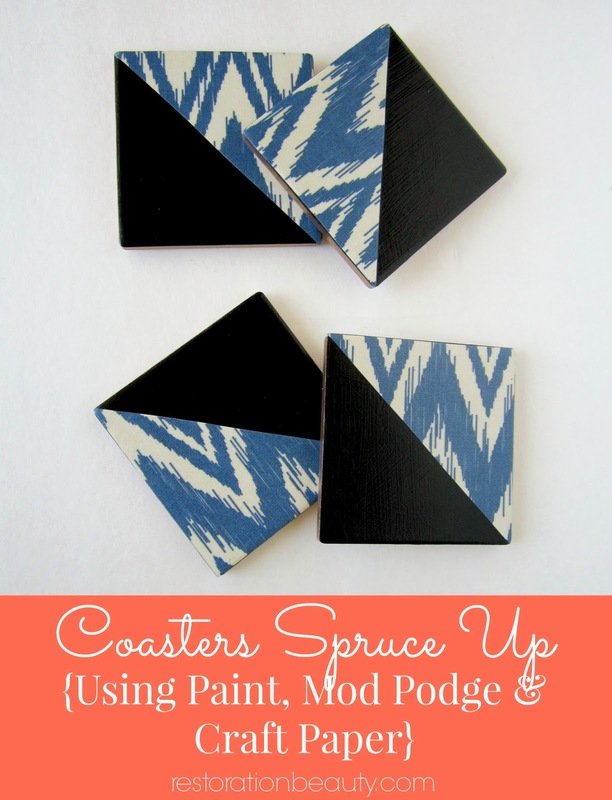 When I saw this post from Cherished Bliss for Love Grows Wild, I knew my plain, boring coasters had a chance for some style just like my wooden coasters turned Spring Inspired Painted Coasters once did! I had already spray painted these coasters black (so my apologies for no "before" photo) but plans were semi changed when I found some fabulous blue and cream craft paper at Hobby Lobby. Instead of color blocking them with another color (yes, it was going to be gold! ), I decided to decoupage the craft paper into them! 1. I used one of my coasters as a guide to cut out 2 squares. I then cut the squares diagonally to make a total of 4 triangles. I ended up with 1 triangle for each square. Hey, I can do math! 2. This was the fun part! 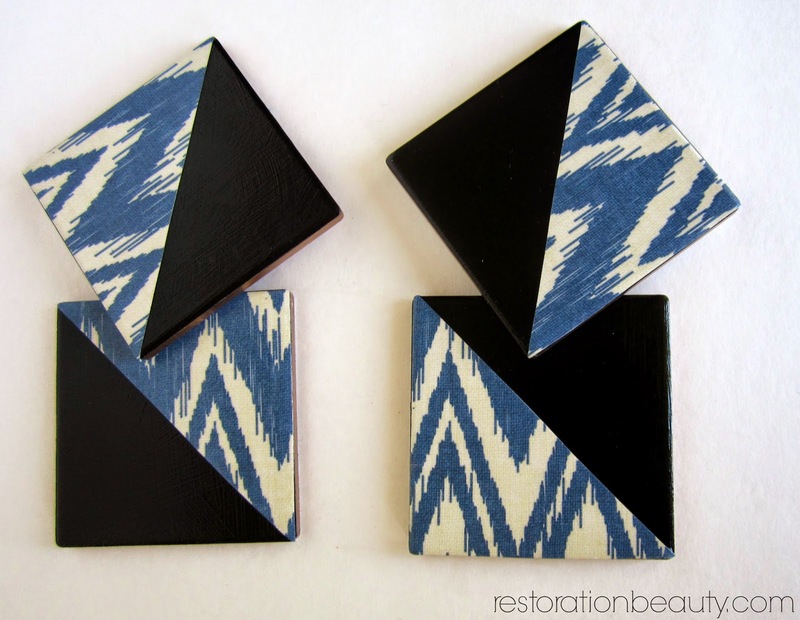 I applied a generous amount of Mod Podge to each triangle and laied it evenly on a corner of each square and gently smoothed it out with my thumb. 3. THIS IS IMPORTANT: I WAITED 20 MINUTES BEFORE SEALING IT WITH MORE MOD PODGE!!!!! I read here how important the waiting time is in order to avoid getting wrinkles or bubbles! It worked! 4. I applied 2 more coats of Mod Podge (20 minutes apart) and let them dry for three days before using them. 5. For extra pizzazz, I used a Bronze Sharpie around each coaster. This was a last minute thing or I would have Mod Podged over the Sharpie, too. And then they were ready to go! I did notice that setting a cold glass of water created a bluish ring on the coaster. I freaked out thinking my coasters were ruined but the ring disappeared overnight! Hallelujah! Why the blue ring? I don't know, don't care...it went away! I love the extra detail the bronze trim makes! So fun and chic! I'm so glad I thought of this last minute detail! Those always seem to work out the best! We now have more coasters than we do people living in the house, but that's okay! At least we're prepared! I think the next thing I want to decoupage is fabric! 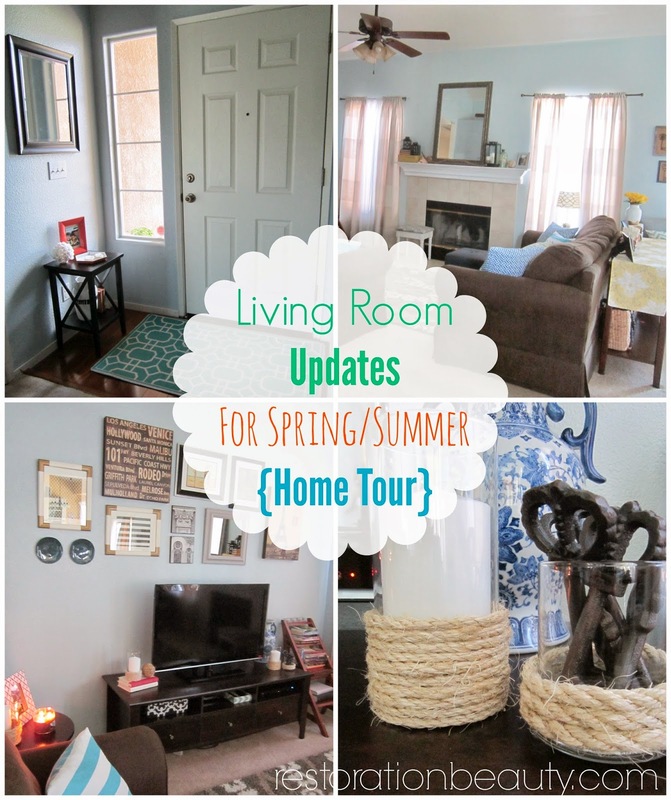 Are you into Mod Podge? 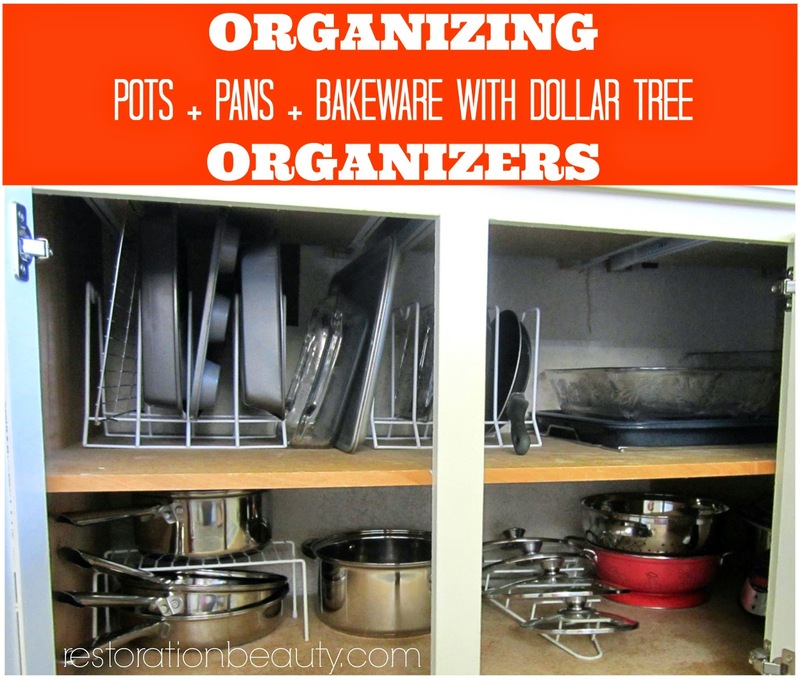 Do you have any other uses or ideas for it? I'd love to hear about them.... because obviously, I'm 80 and have nothing better to do. I didn't know you can seal it with just modge podge!!!! Thanks for the tip, love the coasters! 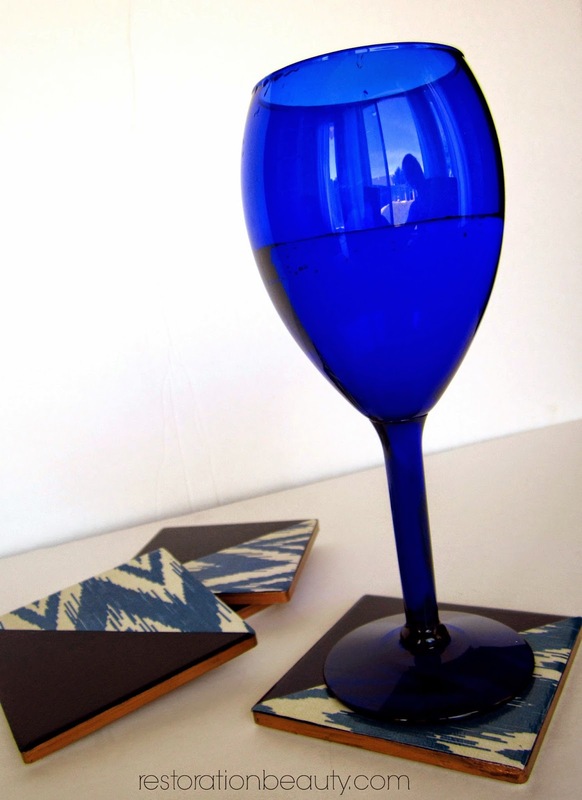 I love how the blue and cream craft paper looks on the coasters! I love Mod Podge too. I once bought a plain wooden frame from Michael's (I think it was only $1) and Mod Podged some Christmas wrapping paper to it and gave it as a gift. You really can jazz things up with it! I've always used a foam brush to apply Mod Podge, is that what you use? Love the bronze sharpie around the edges too! Thanks Vel! 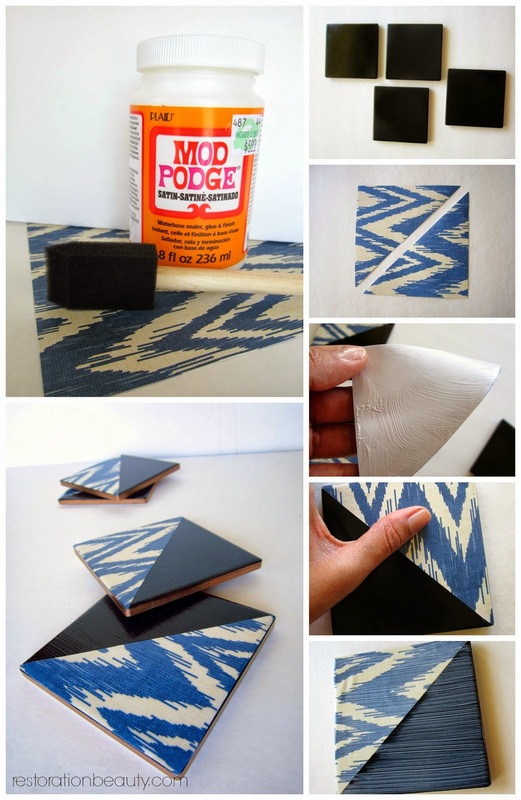 Yes, you can use Mod Podge to seal it!! Amazing right? The frame is a great idea, Lisa! I may have to try that next! Thanks!